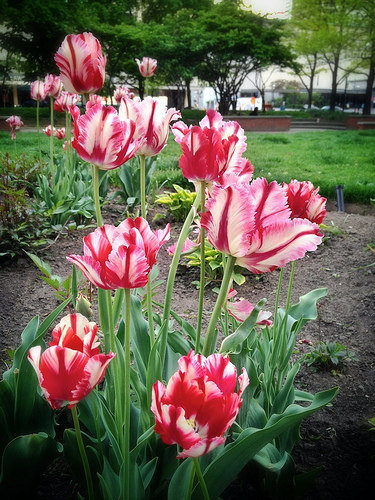 We saw a large bed of these gorgeous tulips along the walkway in Berczy Park behind the flatiron building downtown Toronto a couple weeks ago. Tulips have to be one of the most diverse and beautiful flowers on the planet. They are also one that has shaped the history of our culture. If you have never seen the documentary The Botany of Desire, based on the book by Michael Pollan, you just have to watch this film. It’s extraordinary. It looks at how four plants have changed our world: apples, potatoes, tulips and marijuana. This fascinating film taught me lots that I didn’t know about the origins of these everyday plants. I saw it a few years ago and remember being struck by how much I didn’t know about the history of the apple. You can watch the full length film on PBS’s website. Enjoy! Next Post Arctic Circle, here we come!